In 2002 I began teaching ‘ Jukido-Kai at the Y” at the Hilliker YMCA. In June of 2006 I brought the program to the Union County Family YMCA in Marysville. In November 2007 opened my own Dojo to the public in the Bellefontaine area, The Center for Traditional Martial Arts. I enjoy teaching group classes as well privately for those who seek one-on-one personal instruction. In 2004, I became a member of the American Jukido-Ryu Martial Arts Union Hall Of Fame by receiving an award for Black Belt Instructor of the Year, I also appear in the 2007 Edition of the “Heritage Who’s Who” which recognizes successful businesses and business executives. Sensei Topp encourages his students and instructors to explore other martial arts and instructors. 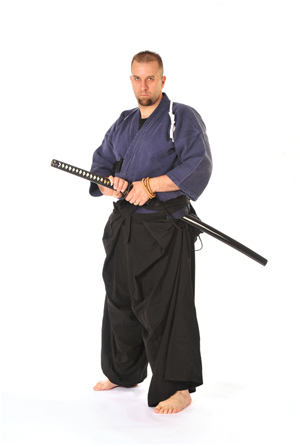 His quality and standards are high and I compare everyone that I train with to Sensei Topp. I also consider myself a student and therefore never stop training and am always eager to learn more. What I love the most about teaching is having the opportunity to help so many people of all ages learn not only discipline, honor and respect, but also how to protect themselves and their families. They are given the tools to help them make the right decisions in life and how to take responsibility for their actions- good or bad.. Not everyone can become a great Martial Artist, but I hope that they will become great human beings.